At The Woods Guest House - Storms River / Tsitsikamma Accommodation. This welcoming property is set in the tranquil village of Stormsriver and offers 8 guest rooms, all with private decks or patios, bar fridges and satellite TV. The Guest House faces the impressive Storms River peak, and the dining room and deck encourage one to sit and enjoy the ever-changing views of the mountain. The garden offers a swimming pool, splash pool and wooden sundeck, whilst inside there are two guest lounges to relax in, as well as an internet station and Wi-Fi..
complimentary tea / coffee tray. televisions with select DStv channels. bar fridge for the guests convenience. Swimming Pool and Splash Pool, with Sun Deck. "In house" guides for forest walks and birding. 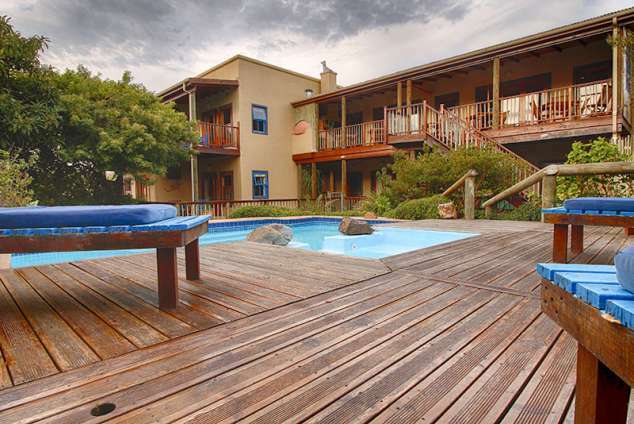 At the Woods Guest House in situated in Storms River Village, a tranquil hamlet conveniently located off the N2, 65km east of Plettenberg Bay, and 170km west of Port Elizabeth. >From Plett, travels east on the N2 for 65km and then take the turn-off to your right signposted Storms River Village. >From Port Elizabeth, travel west on the N2, cross over the Storms River Bridge, and about 4km on, take the turn-off to your left signposted Storms River Village. We are the 4th property on the right hand side, on the corner of the road you are on and Formosa Street. 19122 page views since 15 Feb, 2006. Last updated on 10 Aug, 2017.